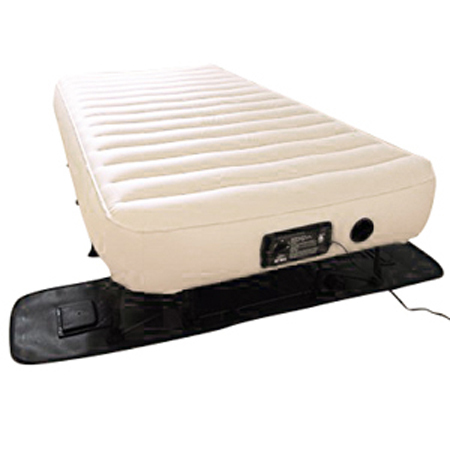 With our update on the best air bed in the EZ category, it’s time to overhaul the dedicated review on SimplySleeper SS-EZT. We have some interesting new info waiting just behind the corner, so we better get to it right away. Height 24 (+/- 1) " 22"
So, we’ve been quite busy with this model for the last couple of months, and we hope you’ll enjoy reading this info-load as much as we did compiling it for you. After the initial introduction, we can move on to pleasant and not-so-good user experiences. It’s a perfect little traveling companion. I’m out of the country for work most of the time, and I really needed a good and dependable bed to carry with me. If I ever have to sleep on a cheap hotel mattress… It’s very comfortable, packs pretty compactly for its size and takes just a few minutes to set up or take down. Perfect! The travel case is pretty handy, I must say. It does look kinda bulky at first glance, but it’s really easy to wheel around. I like the fact that the case and the mattress are one basically, so I don’t need to think about the extra storage space for the case alone when I’m using the bed. Really helpful for organizing our guest bedroom. The actual mattress part of the story smelled like plastic somewhat when it first got here. We took it outside, and left it there for almost two days to air out, and the unpleasant smell was gone completely. I love these ezy beds but the one I had before, the Serta EZ, was honestly a superior product. The first thing we need to set straight is the material of the frame. For some reason, a lot of people think the frame is made of hard plastic. That was the predominant concern of the people we talked with, at least. We’re here to put your mind at ease when it comes to this uncertainty. The frame is made of steel, and both user reviews and our tests proved it to be very solid and quite capable of handling its share of the weight. We’ve conducted pressure and frame endurance tests, and the mattress performed beyond even our expectations. When it comes to durability, it jumped from 79 to 80/100 for this update, thanks to a lot of user reviews in the last two months. It also moved up one point in the comfort department, so it reached 81/100. The material seems just as tough in the EZT hideaway as in the other SimplySleeper models we reviewed (the SimplySleeper 58-RF and the Simply Sleeper SS-47T ). The overall rating, as we already saw was 79/100, which is marginally better than it did two months ago. It’s not a big leap, but it’s what we like to call “steady growth”. The buyers are slowly piling up, and positive reviews are starting to kick in slowly. The things users liked the most are the comfort, the independent inflation/deflation and the integrated travel case. We like more to focus on things like durability and general performance. The uniform sleeping surface is what contributes the overall comfort the most. Unlike many other inflatable beds, this model keeps it firm throughout, instead just having the firm core and flimsy, unsupportive edges. The fact that we can just flip the switch and leave to do its thing is a reasonable time-saver, but the real advantage is the fact that it’ll reach the desired firmness on its own, without us having to time the exact moment to turn it off. I don’t know about you, but I never seem to be able to get it just right. I always end up with my bed being too soft or too firm. So, having preset options is just what the doctor ordered. The “carry” case is one with the mattress, so we don’t have to think about any additional storage for it while we’re using the bed. It simply opens up and lets the bed come out when we need it. Great option in both our and the user opinions. As we said already, we hope you enjoyed reading this dedicated review, as we sure enjoyed writing it and testing this model. The sale numbers for it are pretty slim so far, but it’s an excellent piece of inflatable furniture, and we hope to change the unjustly low numbers by the next update. We’ll be seeing you all back here in two months.